One of the most important questions that free software is facing in the year 2019 is: how do we make the world of free software accessible to broader audiences? Vast numbers of people are using software every day -- how do we relate our message to something that is important to them, and then welcome them into our community? In order to achieve our mission, we need to invite people and get them to use, create, and proliferate ethical software, until all technology is free. 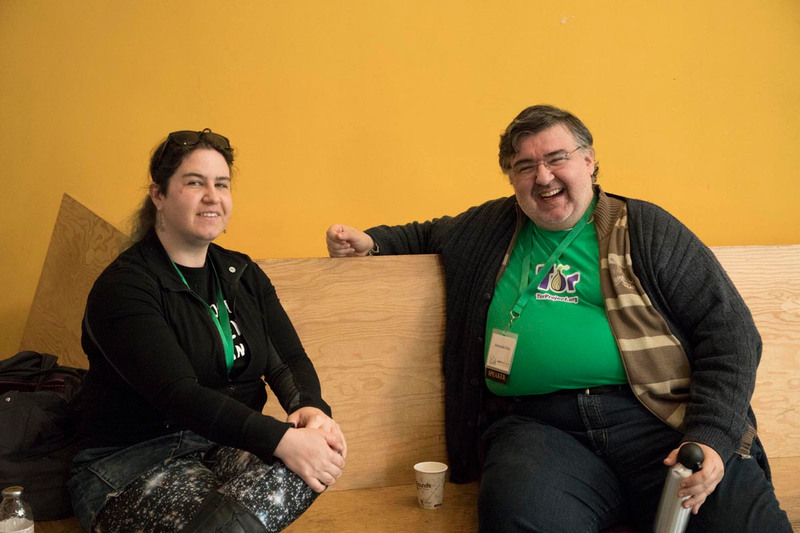 Many of the best talks at LibrePlanet 2019 echoed a message for the free software community to focus on building a culture that's respectful and encouraging for new people, respecting a wide variety of personalities and values. The first way to get people invested in the culture of free software is to make it fun, and that was the focus of the morning keynote, "Freedom is fun! ", delivered by free software veteran Bdale Garbee. 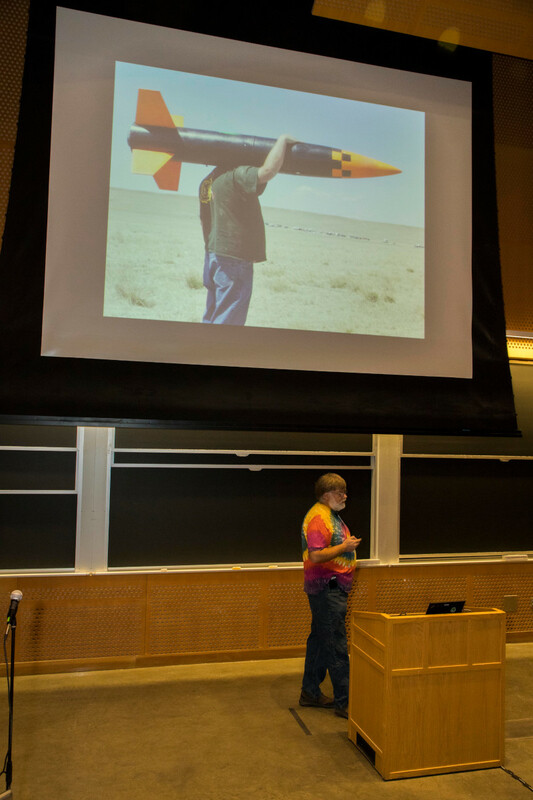 A prominent name in the free software world for decades, Bdale talked about how he has a habit of turning all of his hobbies into free software projects, starting with model rockets. He detailed how some of the most prominent changes made to free software are made by people working through one particular problem and creating a unique solution that is valuable to them. The joy of experimenting and the magic of constantly improving systems through "people scratching their unique itches" provide far greater benefits than any company could ever create through the closed model of proprietary software. Bdale also stressed the value of inviting new people, as well as thanking people for their contributions. 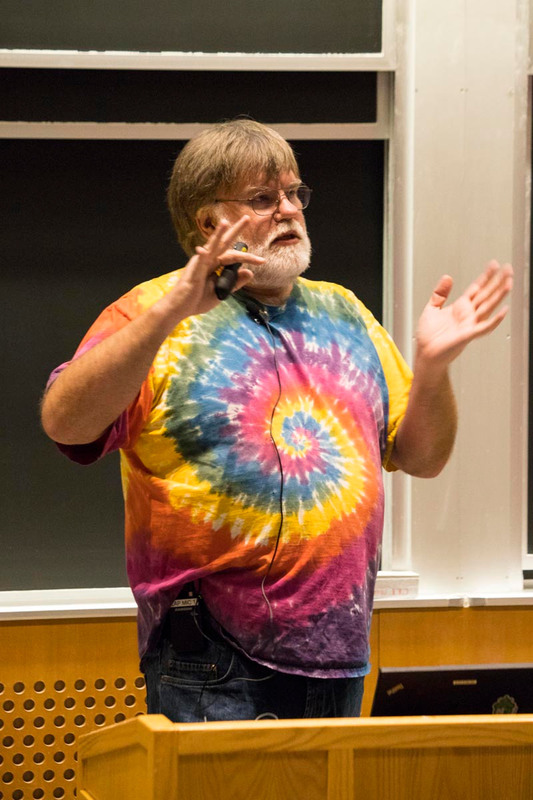 He urged all free software users and contributors to have fun, use your hobbies and interests as a way to experiment and develop, and to not hoard these new ideas... instead, share them! Other morning sessions included Kate Chapman's presentation on the history and future of Free Software Award-winning OpenStreetMap, as well as Micah Altman's introduction to the important possibilities presented by the free software redistricting application DistrictBuilder. In another talk, on "Right to Repair and the DMCA," Nathan Proctor outlined how our right to repair and maintain products is a free software issue as well as an environmental issue. The throwaway culture is a direct consequence of the manufacturer's choice to restrict diagnostics and repair of any product owned by the individual. In her talk on the "meta-rules for codes of conduct," Katheryn Sutter returned to the theme of inclusiveness by prying open many distinctions in the ways that free software enthusiasts and other communities can communicate well, and communicate poorly, and enumerating some of the ways we can come together in respectful and productive ways. Although we all agree on many values within the free software community, we may disagree on others, and it's hard to create codes of conduct that will satisfy everyone, across a variety of experiences and backgrounds. The idea of the code of conduct, then, is not to eliminate all disagreement or stifle participants; Sutter emphasized that the goal is to "create and protect safe places for conflict." Sunday afternoon, Free Software Award winner and community-building champion Deborah Nicholson delivered a talk on "Free software/utopia," using examples from her work on GNU MediaGoblin, Outreachy, and other free software initiatives to demonstrate how to create and maintain projects that attract and welcome newcomers, and reward the time and care invested by contributors. She highlighted her efforts to consciously sustain a positive development environment; in her opinion, it's better for a project to lose one big contributor whose behavior is detrimental to the community than any small contributor who treats others with consideration. Next came the Lightning Talks session, which provided attendees with an opportunity to give a five-minute presentation on their work and their ideas. 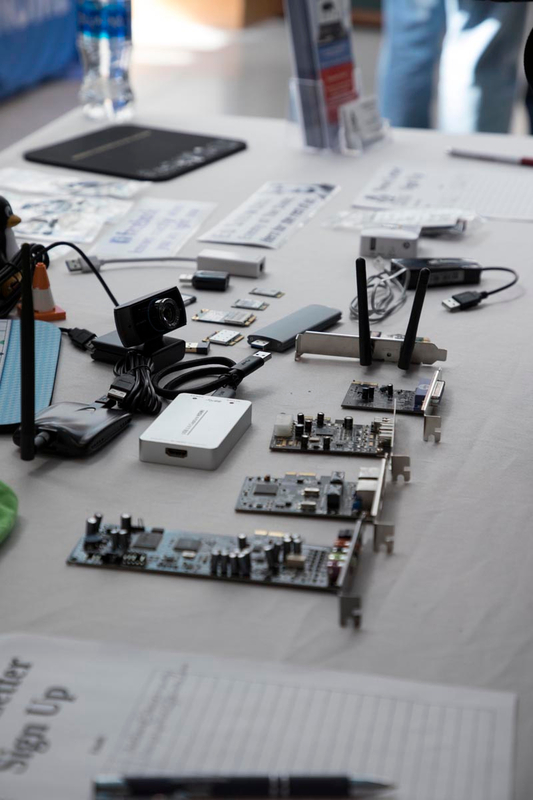 Topics ranged from how we're facing an existential crisis because fewer hardware and firmware products fully support the use of free software, to how Purism managed to design a fully functioning Librem 5 Dev Kit with 100% free software. Projects shared included Mission Possible, a primary school program teaching children the four freedoms the FSF promotes, and Vegan on a Desert Island, a free software video game project answering the common question of what a vegan would do when stranded on a desert island. Blueprint, a team of UC Berkeley students working pro bono for nonprofits, talked about the mobile app that they're building for the Free Software Foundation. All of these talks gave a glimpse into the knowledge and creativity shared by the free software community -- the scheduled conference talks only scratch the surface of all of the multifaceted work that our supporters do every day! Finally, the day ended on a bracing and sobering note with a keynote speech from Micky Metts, a prominent free software activist and member of the Agaric Design Collective, the MayFirst.org leadership committee, and Drupal. In her speech "How can we prevent the Orwellian 1984 digital world? ", Micky talked about what's truly at stake if we fail in our efforts to make all software free: corporate technological entities already are intruding into our private lives in some truly terrifying ways, and the situation will only get worse if our movement doesn't grow and change for the better. Ultimately, free software must form the foundation of a movement to regain our personal power. 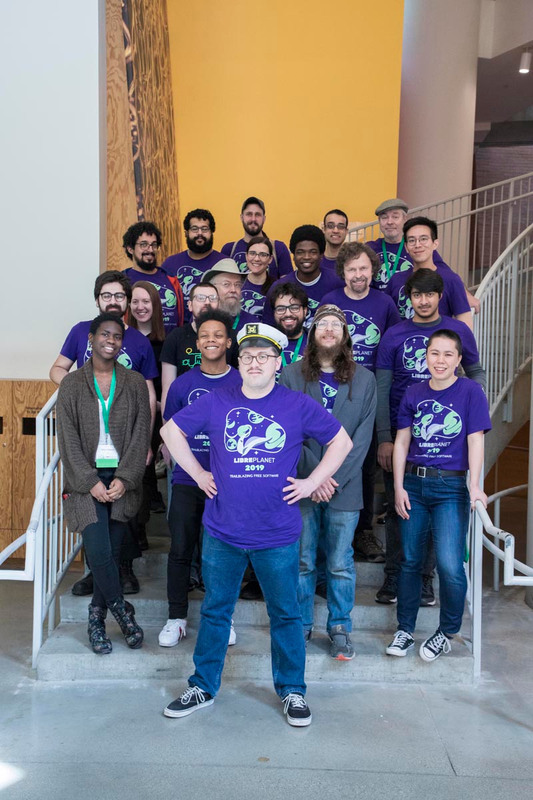 Over 341 people participated in LibrePlanet 2019, which was powered by 53 amazing volunteers, who ensured that everything from video streaming to IRC chats went smoothly. We also gave away raffle prizes generously donated by Vikings GmBH, Technoethical, Aleph Objects, ThinkPenguin, JMP, Altus Metrum, LLC, and Aeronaut, and we're extremely grateful to our generous sponsors, including Red Hat and Private Internet Access. Between Saturday and Sunday, there were 66 speakers and over 40 sessions. Videos will be posted soon at https://media.libreplanet.org, so keep an eye out for announcements -- whether you were here in Cambridge, watched the livestream, or missed LibrePlanet entirely, there's so much more you'll want to see! And if you were at the conference, please fill out the feedback form, so we can make next year's LibrePlanet even better. Photo credits: Copyright © 2019 Free Software Foundation, by Madi Muhlberg, photos licensed under CC-BY 4.0.